AVAILABILITY: Limited Inventory. Sell Out Risk. In this strategy game, you play with decks of illustrated cards instead of a board. These collectable cards represent magical spells and fantastic creatures. 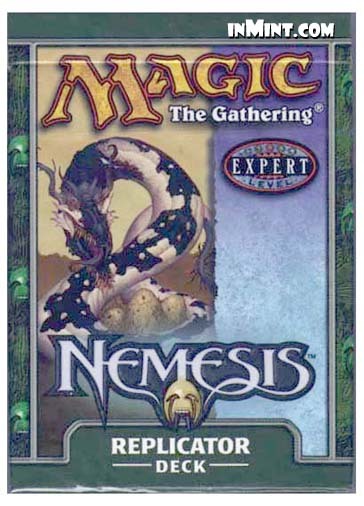 New players should begin with a Magic: The Gathering - Starter game. Your opponents will have double the trouble defending against the duplicating creatures of "Replicator." what little more it costs to play these harbingers of doom is well worth the suffering they inflict. A ready-to-play 60-card deck and a customized strategy guide. Rulebook not included. Magic design by Richard Garfield.